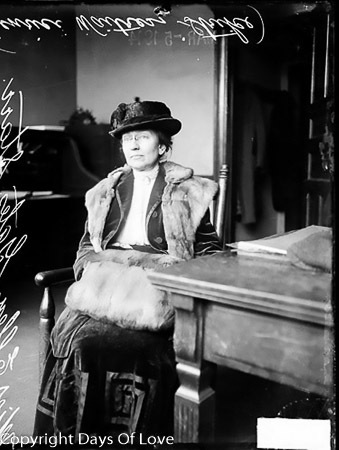 '''Ellen Gates Starr''' (March 19, 1859&nbsp;– February 10, 1940) was an American social reformer and activist. She, along with Jane Addams, founded Chicago's Hull House in 1889. Ellen Gates Starr was born on March 19, 1859 in Laona, Illinois to Caleb Allen Starr and Susan Gates Child. From 1877 to 1878, Starr attended the Rockford Female Seminary, where she first met Jane Addams. Forced to leave school due to financial concerns, Starr taught for ten years in Chicago. She also sought to bring the Arts and Crafts movement to Chicago. In 1894, she founded the Chicago Public School Art Society with the help of the Chicago Woman’s Club. The goal of the organization was provide original works of art and good quality reproductions, to promote public school learning and an appreciation of beauty as a sign of good citizenship. Starr was the president of the society until 1897 when she went on to found the Chicago Society of Arts and Crafts. Starr was also active in the campaign to reform child labor laws and industrial working conditions in Chicago. She was a member of the Women's Trade Union League and helped organize striking garment workers in 1896, 1910, and 1915. However, by belief she was firmly anti-industrialisation, idealizing the guild system of the Middle Ages and later the Arts and Crafts Movement. She was arrested at a restaurant strike. In the slums of Chicago, she taught children who could not afford school education about such writers as Dante and Robert Browning. She practiced her preachings about community labour to the extent of traveling to Britain to learn bookbinding. Faderman argues that Starr was Addams's "first serious attachment". The friendship between the two lasted many years, and the two became domestic partners. Addams wrote to Starr, "''Let's love each other through thick and thin and work out a salvation"''. The director of the Hull-House Museum at the University of Illinois at Chicago, Lisa Lee, has argued that the relationship was a lesbian one. Brown agrees that the two can be regarded as lesbians if they are seen as "women loving women", although we do not necessarily have any evidence for genital sexual contact. The intensity of the relationship dwindled when Addams met Mary Rozet Smith (who had been Starr's student at Miss Kirkland's School), and the two women subsequently set up home together. Although Starr possessed an interest in Roman Catholicism for many years, it was only when she believed the Church was seriously teaching social justice that she converted in 1920. Even after that, her work in campaigns against child labour met with much opposition from inside the Church. In 1929, complications caused by surgery to remove a spinal abscess led to her becoming paralyzed from the waist down. In 1931, seriously ill, Ellen Gates Starr retired to a Roman Catholic convent where she was cared for by the Society of the Holy Child Jesus, but she was not a member of their religious community, or any other. Starr died at the convent on February 10, 1940 in Suffern, New York. ^ Mary S. Donovan, "Women's Ministries in the Episcopal Church, 1850-1920, Wilton, CT:Morehouse Barlow, 1986, pp. 148-154.